Saturday- We were out the door at 9AM to go to the Arts and Crafts sale at the park. This sale was for the items made during the year here in the park. We rode our bikes over to the Activity Center and started in the woodworking shop, Bob’s home away from the MH! I had never been in the shop. They certainly have a lot of great equipment. The items for sale or to be raffled off were awesome. There was even a large clock and an Eiffel Tower. There were lots of bowls and jewelry boxes. We continued on to the silver shop, the pottery shop, and to the ballroom for the rest of the items. The card group had a table and they made $98 on $ 1, $2 and $3 cards. Try buying a Hallmark card for those prices! There was also lots of jewelry. I bought two pairs of glass earrings for $10. We returned to the MH and I took off to go to St. Vincent de Paul to drop off donation items. I bought a pretty shirt for $3. Then I went to my hair appointment. On the way home, I stopped in a Burger King and picked up lunch for the two of us. We had a short nap, then went to dinner at Twisted Italian as we had a $10 Groupon we needed to use before we leave. Bob had the chicken parmesan and I had the penne. Both of us took home half our meals. We returned home and watched TV while reading. Sunday- We paid bills and I worked on an article. At 11:20 we picked up Linda and Mike and drove over to the Elks Lodge, meeting up with Paula and Charlie for brunch. Bob and Charlie had the Frittata, and Bob said he would not have it again. It had sour cream and marinara sauce on it and he said that the marinara over powered the eggs. I had the Denver omelet. I don’t know where they get their fruit, but the fruit has been excellent! Then of course there is everyone else, who go to buy stuff! Of course they eat the samples also…. Anyway, we flew through and there was only one person in line ahead of us. We stopped at Walmart and then returned home to take a short nap. At 4, we went to Linda and Mikes for happy hour. We sat out until 6:30 enjoying the great company. We returned and ate the left over corned beef and cabbage from St. Patrick’s Day. Monday- We left at about 8:40, driving north on Hwy. 60 to Wickenburg, where we changed to Hwy. 69, driving northeast. We turned onto Hwy. 89 and continued north. A few miles after entering Hwy 89, we came to Congress and the North Ranch Escapees Park. We drove through just to take a look. Not sure we would want to stay there for a long period of time, as it is really out in the middle of nowhere Arizona! We continued on Hwy 89, which was very scenic. We drove from an elevation of about 200 ft to 5600 ft, as we wound through the mountains and out of the Valley of the Sun, The road was single lane and really did a lot of “s” curves. We finally reached the top and there were pine trees, the first we have seen since last fall! Hwy 89 went right through the town of Prescott, our destination. ‘In 1864 Prescott was designated as the capital of the Arizona Territory, replacing the temporary capital at Fort Whipple. The Territorial Capital was moved to Tucson in 1867. Prescott again became the Territorial Capital in 1877, until Phoenix became the capital in 1889. The new town was named in honor of historian William H. Prescott during a public meeting on May 30, 1864’( from Wikipedia). We parked across from the very large town square. Hwy 89 is “Whiskey Row”. This was a bar row in the late 1800’s. The buildings burned down in a fire, July 14, 1900. They were re-built by 1910. 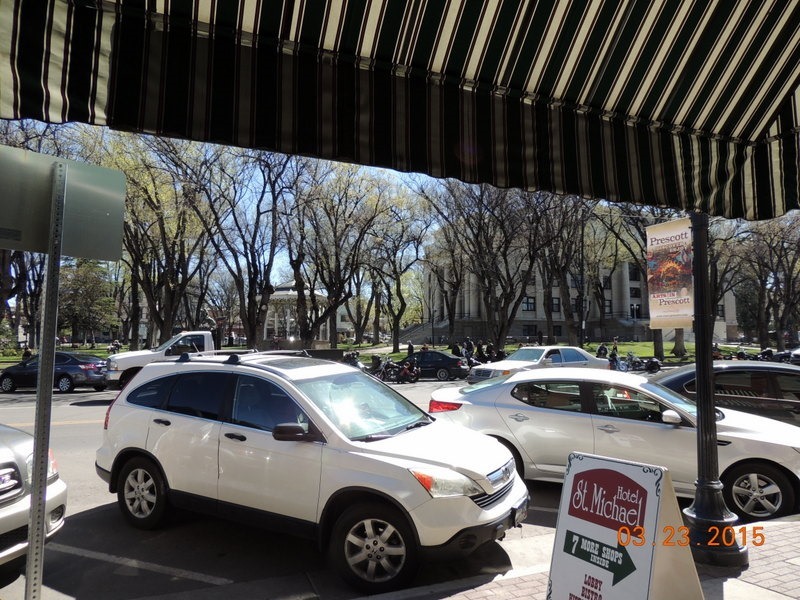 Prescott is the county seat of Yavapai County, which was divided because the area was so large, forming Maricopa County, which is where we are staying. The town square is larger than many we have seen. 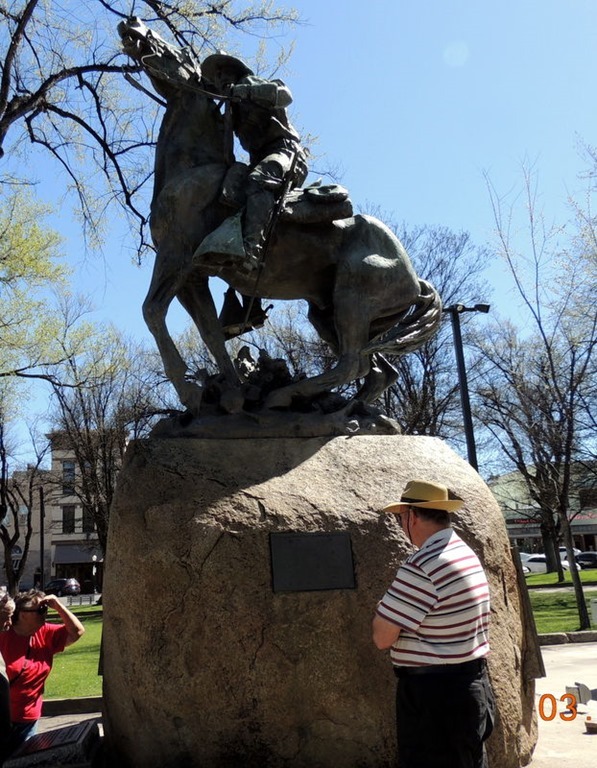 This statue is in tribute to the Rough Riders. On the sidewalk leading from the street directly in front of the courthouse, they have put a timeline into the concrete. 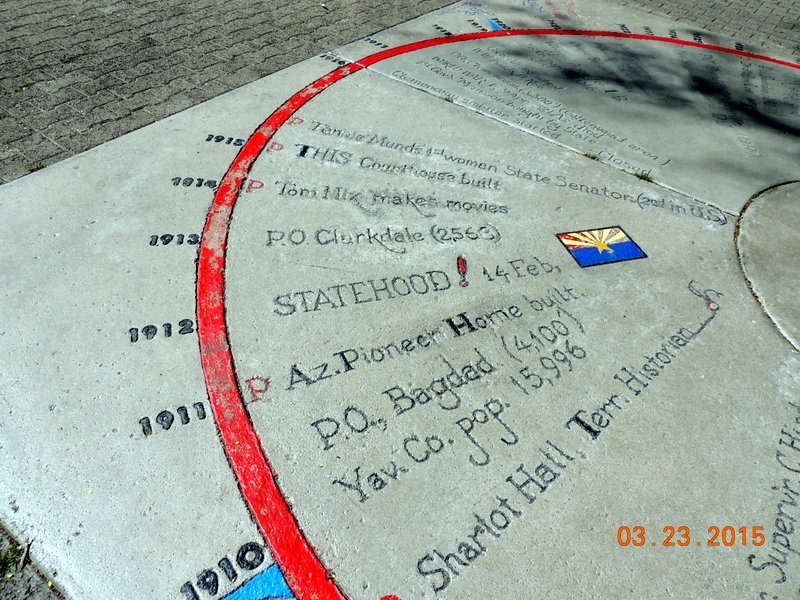 Here is the section which shows when AZ became a state. 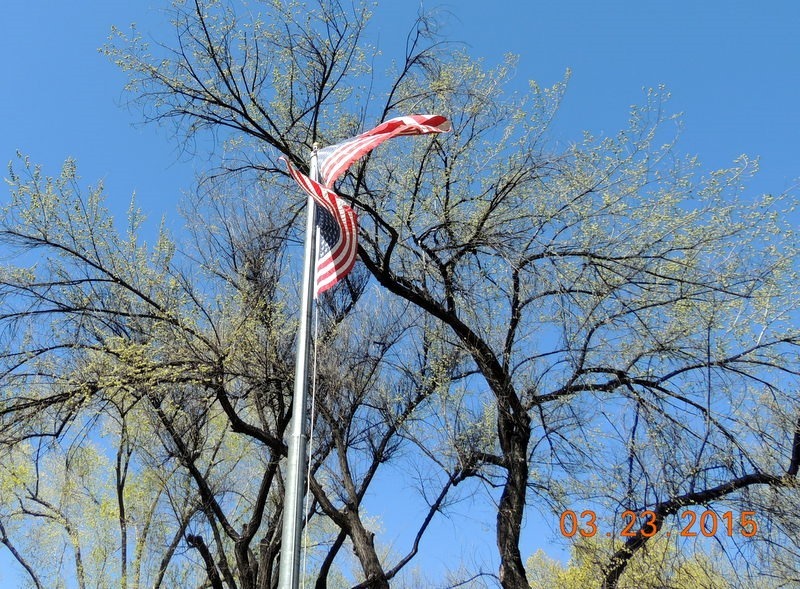 This is a memorial to WWII veterans, and note the two flags up above. One of the flags has less stars, so we assume it was the flag from when AZ became a state. 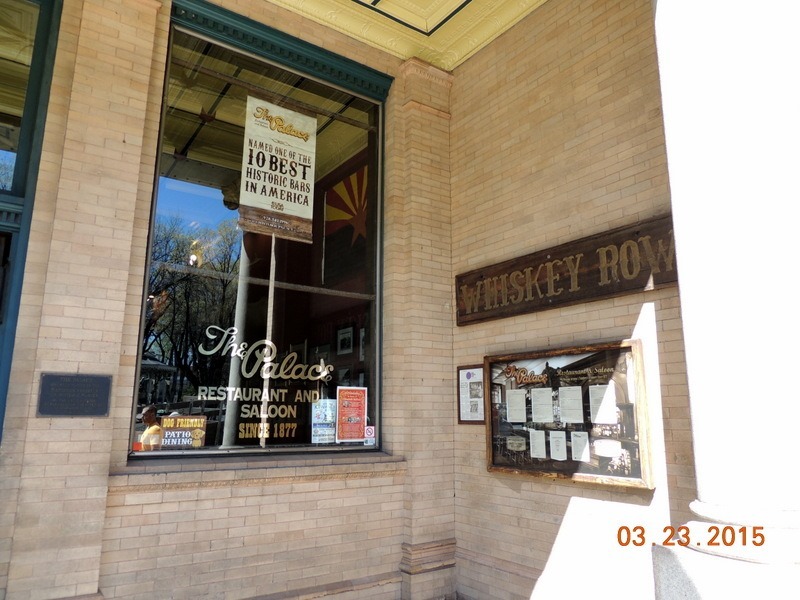 We ate lunch at the Prescott Brewery. Bob had the Achocolypsc a chocolate porter which he really liked. After lunch, we drove through town. 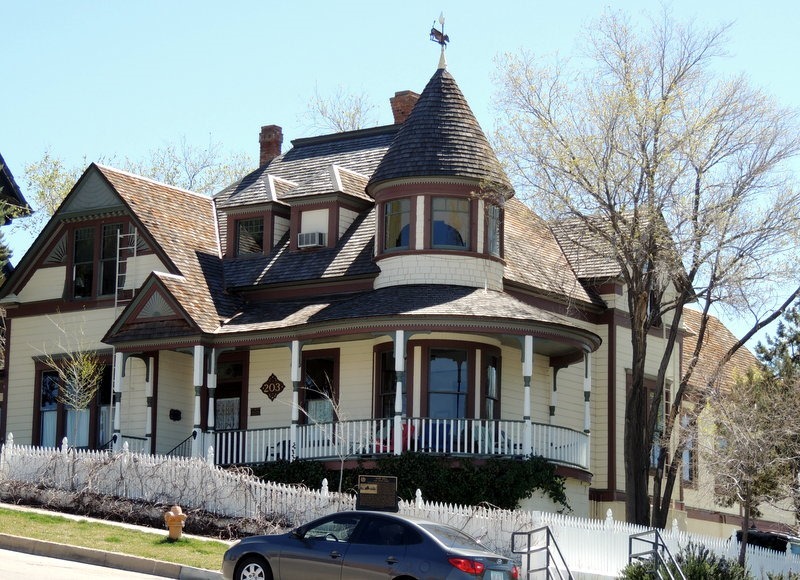 We found these pretty Victorian Houses in the “Nob Hill” section of town, on a hill, overlooking the courthouse. Above is the Goldwater house. 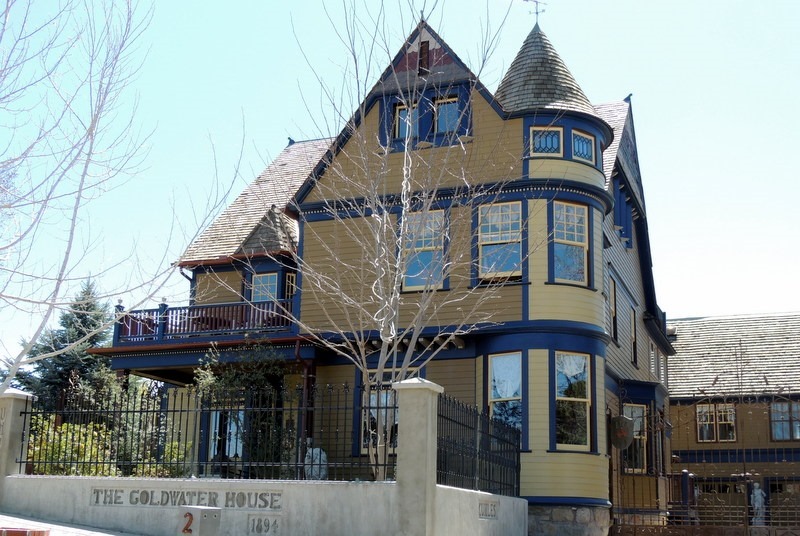 The Goldwater’s were founding fathers of Prescott. Barry Goldwater is the nephew of Morris, one of the primary founders of the town. this was Morris’s house. We left town continuing on Hwy 89 taking us back to I-17 and south towards Phoenix, about 96 miles away. We continued south to Rt. 303, a by-pass around Phoenix. We have never taken this route from this direction but we will be when returning to the area. Wow, it was a lot better than taking I-17 to I-101, then driving through Glendale and Peoria to Paradise. Instead we took the road to Lake Pleasant ( a mistake, we should have gotten off at Happy Valley) and we turned onto Happy Valley, which took us to 107th street. We tried a back way, as if we were in the MH. We would not want to make the turn at Union Hills to go to the park, as that is a very narrow turn. Instead, we took a back road to Beardsley, and went down 112 the to Union Hills. It is two left turns, but better than the narrow turn at 107th. Bob walked the dogs then we all took a nap. We ate left overs for dinner. I did some more of the Legacy Webinars, then made changes to my Genealogy, fixing some errors. We ate dinner and Bob listed so an Astronomy Class and I watched another Legacy Webinar. Tuesday- We left at 8:45 to go to the WVGL. Our name tags with the bar code for entry are not yet ready, but we are now in their computer system. We stayed until 11:30, then returned to the MH. We ate lunch and at a little before 1, I left to go to Bunco. I asked for copies of the forms to use at the Pre-rally in Casa Grande. I am planning to make copies of them. Meanwhile, Bob took the sheets and towels to the laundry. I returned and did another Webinar. Bob watched another Astronomy Class. We ate dinner and worked on various projects. Wednesday-I worked on an article this morning. Bob checked the MH batteries. He had to run to Bash’s to pick up distilled water to fill the batteries. He found that relay that charges the house batteries is not charging. He fiddled with it, but finally called Bulls Eye RV repair to come our to look at it. They did not have any appointments available. So he called the RV repair guy for Palm Creek, where we are going next. They wanted him to take the MH into the shop. We can’t do that because we are involved in the rally. So he ended up calling a third repair guy, who it turns out has a booth at the rally so he can’t look at the issue either. He suggested that Bob call Alfateers, which he Bob did and he submitted a repair request. We will see what happens! Through all of this, we had been doing laundry. We made several doctor appointments. We ate lunch, then at 1, I rode my bike over to the activity center for Mahjongg. I won 3 games in a row! I returned and Bob had been working on some other items around the MH. He also ran over to Paula and Charlie’s to assist Charlie with replacing the roof vent fans. Charlie did not want to climb up on his roof, so they have called Bulls Eye to come to put the new fans in. They are not going to the rally because of Paula’s radiation, so they were able to get an appointment. Bob had rec’d a call back from Alfateers from John the owner. He discussed the issue and said he would have Martin call. A little while later, Martin called and Bob did some of the tasks that Martin gave to him. It seems like they worked, as we have the clunking noise again which means that the batteries are charging. He is going to wait a few days and call back to cancel our appointment for the repair at the rally. Thursday- We worked around the MH in the morning then I went to lunch at friend Annette’s pretty house in Sun City West. We sat out on the patio until it became a little too warm. We moved inside and I assisted her with setting up Facebook and Pinterst. I returned home in time to meet the Alfa Gang at the Ice Cream Social sponsored by Encore. What a waste that was. It started at 1, and we arrived at 2. The goody bags were gone and the ice cream was little, bitty ice cream sandwiches. A group decision was made to go to Dairy Queen, so off we all went. We stopped at Walmart on the way home as we were out of bread. We ate dinner at home, watched TV and did some computer exploring. 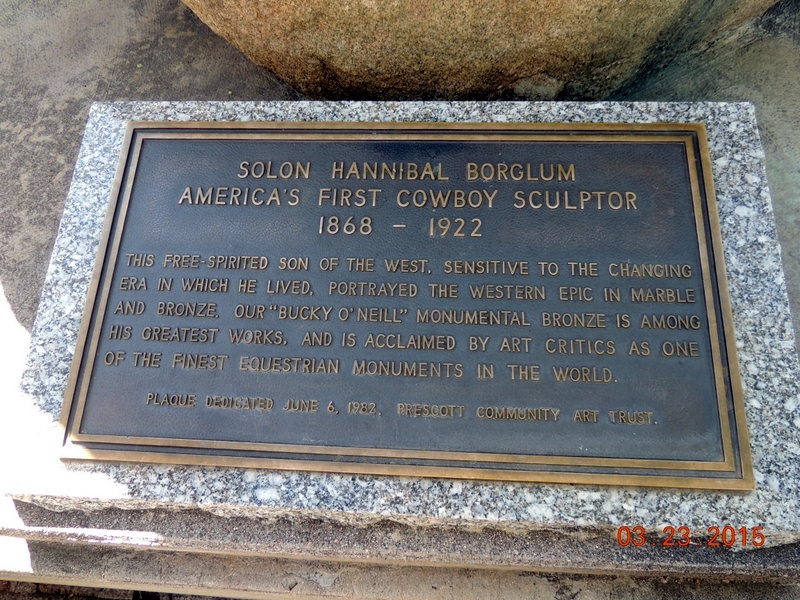 Friday- We left to go to the WVGL to continue our research. Our names are now in the computer and they sent us an email with our information so that we can get into two of the international Genealogy websites, Fold 3 and Worldwide Vital Records. They are having a problem with their laminating machines, so we have not been able to get our name tags, yet, and maybe not before we leave next week. While we were there I rec’d a text from a friend in Maryland who I used to work with at PG Hospital. Our friend Dee Eimer had lost her daughter this morning. She woke to find that the grandkids were still in bed and when she went to check on her daughter, Eileen was dead in bed. A devastating tragedy, for a young mother with five children. Live is definitely too short and you never know what each day will bring! We returned to the MH and took a short nap. We worked around the MH, ate dinner, watched TV and went to bed. Wish I knew you were at North Ranch. We were there for a week taking the woodcarver workshop. We stayed on JerriLea & Ron Hopf’s lot. I love the park but like you its not for me. Way to far from civilation. We are now at Rovers Roost on our lot till Wednesday when we start heading back east.